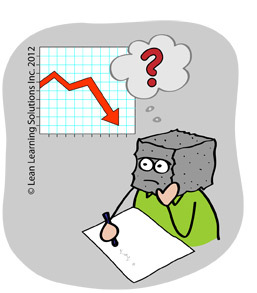 Lean Thinking: How Do We Change Our Thinking? Organizations around the world can't seem to do what they're trying to do. America, our management lodestar for most of the 20th century, is struggling with seemingly intractable economic & political difficulties. Europe, if anything, is doing even worse. In spite of everything, I believe things are going to be okay. America, Europe and the world will muddle through in 2012. Over time, I believe we'll resume the path of continuous improvement in health, freedom & prosperity. How do we accelerate this process? I believe many of our current problems are the result of dysfunctional mental models. Leaders believe that they & they alone are qualified to identify & lead needed improvement efforts. "What can we learn from front-line team members?" "To improve, we need to launch a bunch of new Initiatives! Wait, we'll need an Initiative Tsar!" We can manage all our 'Initiatives' from a distance, by the 'numbers'. "We don't have to go see. We don't have to get our hands dirty. You know, we don't even have to know that much about our business." "Ok, just tell us what to do..."
"The problems & countermeasures are clear. Why doesn't our leadership ask us?" "Okay everybody, here's our list of 147 focus projects for 2012!" Virtually all my books address these themes, across a variety of industries. An esteemed sensei posed this question a long time ago. It remains our key to the kingdom. In 2012, I'll dig deeper into these mental models & this question.